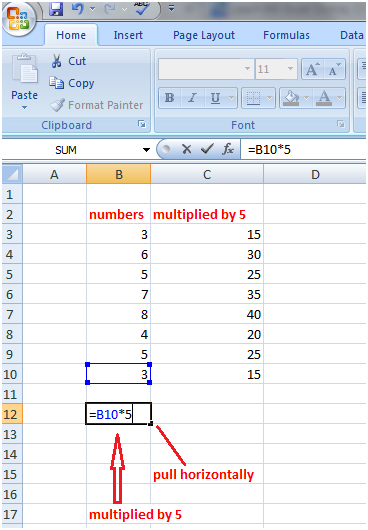 In the image given below, we want to multiply the numbers in column B with 5, so we can type the formula such as =B3*5 for cell B3 and other cells of the column B, but this is not possible with long lists. In such cases, we use Fill handle to perform the calculations. 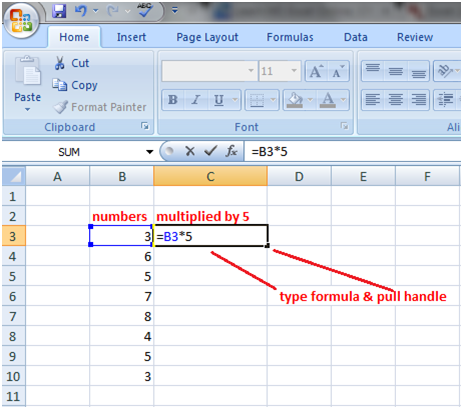 So, type the formula =B3*5 in cell C3 then left click on the right bottom corner of cell C3, fill handle will appear. Pull the fill handle downward till cell C10 then leave the mouse. The whole list of numbers in column B will be multiplied by 5. The pull handle also works horizontally. See the image given below. The value in cell B10 is multiplied with 5 in cell B12 and as you move the pull handle horizontally towards cell C12, the value in cell C10 also gets multiplied by 5.